In this lesson, you will write your first computer programs using Logo. After an introduction to the turtle and its environment, you will learn a few commands that the turtle understands. Then it's up to you to instruct the turtle to draw a bunch of stuff. 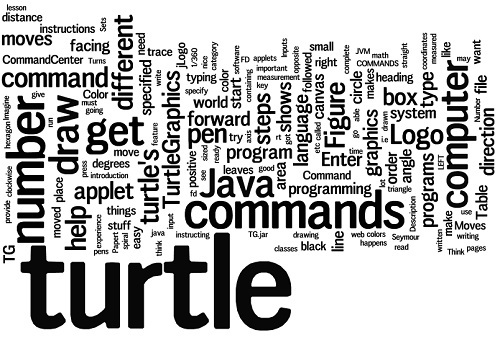 you type commands in a language called "turtle talk,"
leaving a line as it goes. The command "Forward 50"
a spiral or whatever it may be. 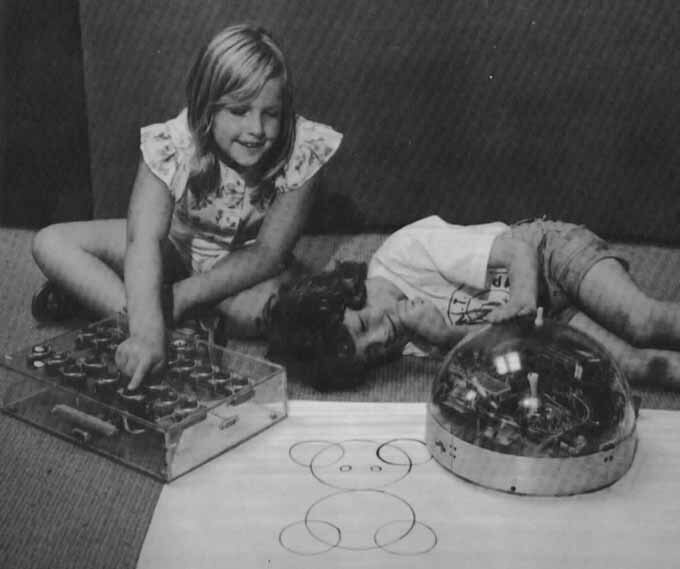 Figure 2.1 shows the original turtle from "Mindstorms," Seymour Papert, Basic Books, Inc., 1980. Wikipedia has a great entry for Logo. jLogo is a version of Logo that is written in the Java programming language. It is sort-of a subset of Berkeley Logo extended to have some traits of Java. Java is just not a good language to start out with. By starting out with jLogo, you will get a good feel for what programming is all about. With this experience, transitioning to Java will not be too hard if this is what you want. You are going to be learning how to write computer programs which draw things on a digital canvas. This makes a lot of sense because most things that you interact with that contain a computer have a display of some sort or another. Think about it; desktop and notebook computers have flat-panel displays, mobile phones have small displays, tablets - check, new cars have a couple, and now even the Nest Thermostat has a little display... They are everywhere around you. 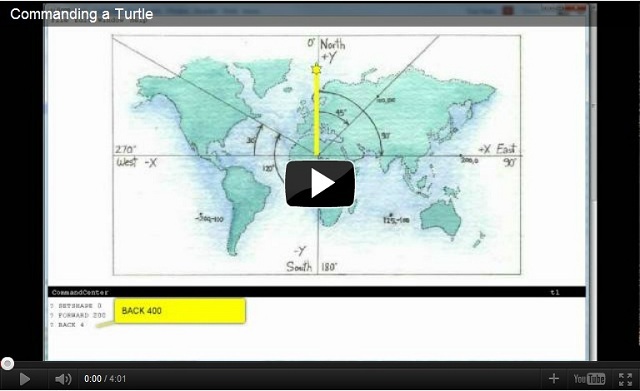 You are going to be instructing an object, a turtle, to move around on a virtual canvas, drawing as it goes. TG, the program you will use, has an area (a subwindow) called the graphics canvas. Think of it as a two-dimensional world in which the turtle lives. Here's what the turtle's world looks like. 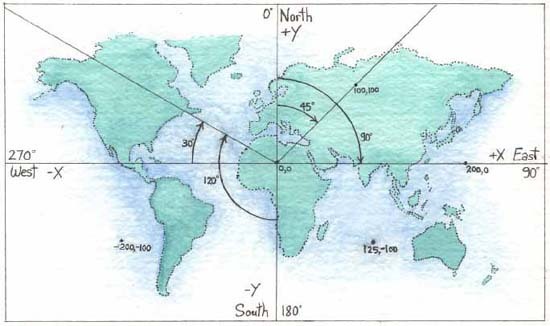 The turtle starts out at the coordinates: 0,0 (the center of its world), heading North. The turtle's world is a bit different from the Cartesian coordinate system that you may be familiar with (from your math classes). If you look closely, you'll notice that the origin for angle measurement is different. 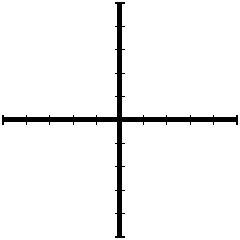 In turtle graphics, 0 degrees is aligned with the positive Y axis instead of the positive X axis. The other difference is that angle measurement in positive amounts measure clockwise rotation, the opposite direction that you've learned in math classes. 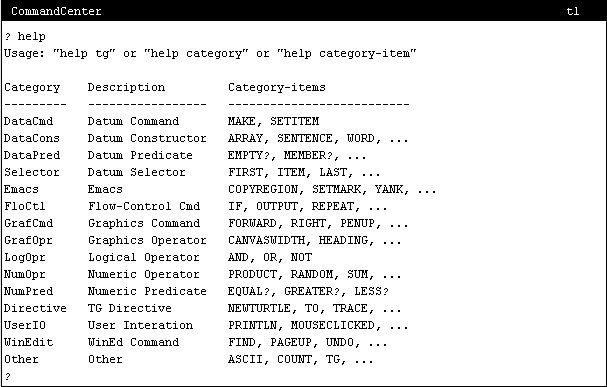 Table 2.1 shows a few Logo commands. Ok, enough of an introduction; it is time for you to try stuff out for yourself. I've written a computer program that has been embedded in these web pages (it's a Java applet) which understands the Logo language. I've named it TG, an acronym for Turtle Graphics. If TG is behaving as it should, you will see two white areas divided horizontally by a gray namestripe with "CommandCenter" and "t1" in it. This namestripe can be dragged up and down by positioning the mouse on it, holding the left button down, and moving the mouse up/down. Move the namestripe if necessary so that there is approximately equal space above and below it. The turtle (the hexagon with head, legs and a tail) is in the middle of the graphics canvas. It is heading north. It has its black pen down, ready to draw a line as it moves. Click the left mouse button in the CommandCenter - an interaction area below the graphics canvas. The namestripe will turn black and a cursor (small, thick, black vertical bar) to the right of a "? " prompt will start to blink indicating it is ready for you to type in instructions. Table 2.2 shows a few more Logo commands. HOME Moves the turtle to the center of the graphics canvas, i.e., coordinates 0,0. PU Lifts the turtle's pen up so that it leaves no trace when the turtle moves. PD Puts the turtle's pen down so that it leaves a trace when the turtle moves. CLEAN Erases (cleans) everything that the turtle has drawn on the graphics area (ClearGraphics). The turtle's state (position, heading, pen color, etc.) is not changed. PLAYCLIP clipNumber A WAV (waveform) audio clip is played. SETBG number Sets the color of the background of the graphics canvas. 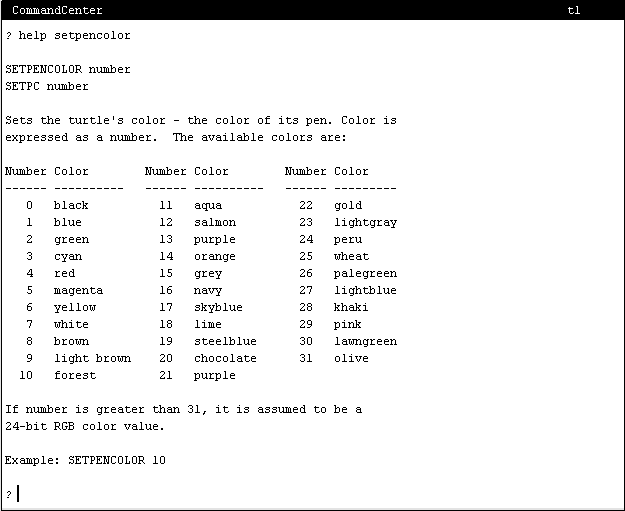 Color is expressed as a number. SETPENCOLOR number Sets the turtle's pen color. Color is expressed as a number as with SETBACKGROUND. SETPS number Sets the width of the turtle's pen, which determines the thickness (in pixels) of the trace it leaves, the line it draws. HIDETURTLE Hides the turtle, makes it invisible. SHOWTURTLE Makes the turtle visible. Instruct the turtle to draw a triangle, a square, a pentagon, a hexagon, ... Again, vary the colors, use different sized pens, and place them at different places in TurtleSpace. In addition to giving the turtle commands, the CommandCenter can be used to get help when you need it. Type "help setpencolor" in the CommandCenter and press Enter. Figure 2.4 shows what happens. For more information about what you can get help with, type help and press Enter. Figure 2.5 shows what happens. Explore what you can do with the help command. help tg will get you an overview of the TG programming environment. All of the commands that were covered in this lesson are from the GrafCmd category. You will get the full listing of commands that fall into this category by typing help grafcmd and pressing Enter. The nice feature of Java applets is that they are part of web pages. Once you have the browser on the page containing the applet, you have access to the applet. But, an important security feature of a Java applet is that it can't do anything to the computer on which it's running. To insure this, applets have no access to stuff on the computer they are executed on. But, as our programs get bigger and more complicated, it is necessary for TG (the turtle graphics program) to be able to read a file containing commands and execute them as it reads the file. You need to be able to change the instructions and/or add instructions to the program, and then save what you've done to a file. Java applications can provide this functionality. The TG programming environment you have been using on this web page can also run on your computer as an application. It does everything that the applet does and more. But, for you to run it on your computer, you need to have a copy of it (TG.jar). Appendix H (Installation of TG) covers how to get it and run it. like writing down the steps to do something. You've learned some of the the jLogo language. If you got the turtle to draw a triangle, a box, etc..., for you, you got experience instructing it to do things in a specific order. And, the order is very important. In programming we refer to this order of steps as a sequence. In our programs, we moved the turtle and then turned it, moved it, then turned it, told it to raise its pen, moved it,... If you put all of the movement commands first followed by all the turn commands, you would not get what you want - you would get a straight line. So, writing a program is all about putting together instructions in a specific order. into the CommandCenter. This will paint an image of a maze onto the background of TG's graphics canvas. 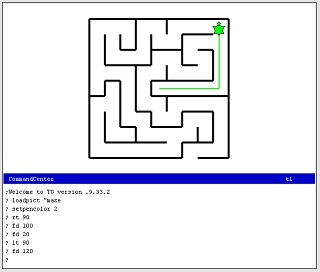 Your challenge... use commands you've learned in this lesson to get the turtle to draw a path out of the maze. Figure 2.6 shows me starting to work the turtle out. 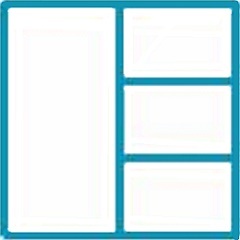 Draw a collection of boxes that looks like the one in Figure 2.7. Draw a pair of axes that look like the ones in Figure 2.8. 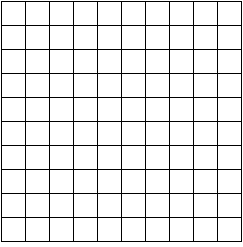 Draw a small grid that looks like Figure 2.9. Back to What Is Computer Programming?